Whichever nutritional path you follow, a key element to consider is not just what you eat and drink, but how to help your body to absorb nutrients as effectively as possible. In this blog we take a look at some simple food and drink pairings that research suggests can help your body to absorb vitamins and minerals optimally. The premise is that two particular foods/drinks consumed in combination can actually deliver more benefits than either one would on its own, which epidemiologist David R Jacobs from the University of Minnesota calls 'food synergy'. He believes that it might explain why we develop a taste for eating certain things together, as well as how they interact to benefit our health. Besides being a good source of fibre and protein, quinoa is also a good source of iron. However, the iron from plant-based foods, known as non-heme iron, isn't as easily absorbed as the iron in meat (heme iron). Combining quinoa with a food that's high in vitamin C, such as red bell peppers, can improve non-heme iron absorption by four times. Vitamin C helps convert non-heme iron into a well-absorbed form of iron. Other good combinations of iron and vitamin C include leafy greens with lemon juice, tempeh with broccoli and lentils with sweet potato. Iron absorption is inhibited by tannins, a plant compound found in black tea, some herbal teas such as peppermint tea, red wine, coffee, cocoa and cranberries. Tannins may have some health benefits, but they can block the non-heme iron, reducing its absorption. Therefore, it's best to avoid drinking strong black tea, red wine, coffee and cocoa at meal times. It's important for the body to take in high enough levels of Vitamin D in order to absorb calcium, which builds and maintains healthy bones. In addition to eating salmon with kale, other good combined sources of Vitamin D and calcium include eggs with cheese and tuna with broccoli. As with many other nutrients, calcium derived from the diet is preferable; some risks have been associated with calcium supplementation. Inulin is a type of fibre that helps balance the levels of 'good' bacteria in your digestive system. It also benefits your bones by enhancing calcium absorption. 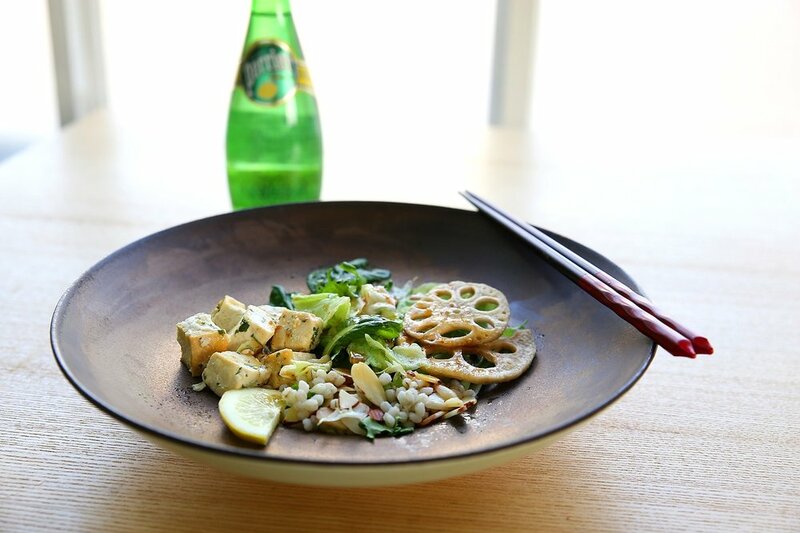 Therefore, try pairing tofu (good source of calcium) with dandelion greens (good source of inulin) in a stir-fry. Other good sources of calcium include yoghurt, broccoli, kale and canned sardines, while other good sources of inulin include onions, garlic, leeks, artichokes, chicory and bananas. Combining healthy fats, for example those found in avocados or olive oil, with particular vegetables can help your body absorb more of the produce's antioxidants (antioxidants include vitamins and phytochemicals). Some vitamins (including A, D, E and K) require fat to dissolve in the body, whereas others, such as vitamins B and C require water only. For example, cooking fresh tomatoes in olive oil can significantly increase the absorption of lycopene, an antioxidant that gives vegetables their red color (although not all red veggies contain lycopene). According to a small study by Purdue University in 2016, when three whole eggs (with fatty yolks) were added to a salad (baby spinach, romaine lettuce, carrot, tomato), the amount of vitamin E absorbed from the vegetables was four to seven times higher than when the salad was eaten without eggs. Studies show that lycopene’s antioxidant capabilities can protect your body from the damage induced by pesticides. Lycopene plays a role in preventing and slowing several types of cancer, and supports brain, eye and heart health. Lutein, another antioxidant that protects your eye health, is also best consumed with healthy fats. Broccoli, spinach, kale and courgettes are all rich sources of lutein. Beta-carotene, which is turned into vitamin A in your body (and needs fat for absorption), supports healthy skin and plays a vital role in healthy immune and reproductive systems. Good combinations are sweet potato mash with olive oil and carrot sticks with hummus. Both of these types of berries contain polyphenols, which are potent antioxidants thought to help protect against Alzheimer's disease and cancer. Research by Rui Hai Liu at Cornell University suggests that eating different types of fruit together provides more health benefits than eating them separately. The research found that, compared to any single fruit studied, combinations of fruit had the highest antioxidant activity. It's important to note that while fruits are an excellent source of vitamins and antioxidants, they also contain acids that cause them to ferment in the stomach and slow the digestion of other foods. So it's best to eat fruits by themselves on an empty stomach to avoid digestion problems, or even enjoy a mixed fruit salad as a mid-morning or afternoon snack. Green tea contains high levels of antioxidants, which can stimulate the metabolism and keep you hydrated. When drunk with lemon, its benefits are further enhanced, with two studies from Purdue University suggesting your body can absorb 13 times more antioxidants than when consumed on its own. Sulfur compounds, found in onions and garlic, help boost absorption of the zinc that's found in whole-grains, nuts and seeds. Zinc is a mineral needed for overall growth and development in the body. It boosts the immune system to help fight infection, helps wounds to heal, and plays a role in more than a hundred enzymatic reactions in the body. Other good sources of zinc include pumpkin seeds and chickpeas. Scientists at the Connecticut Agricultural Experiment Station found that washing produce with running water reduced the amount of pesticide residue for 9 out of 12 tested pesticides. However, other options have been shown to be more effective than plain water, including salt water, vinegar water or baking soda water. If you follow a largely vegetarian or vegan diet, then soaking (and potentially sprouting) your grains, nuts and seeds can help you to remove phytic acid, which can affect the absorption of essential minerals. However, this is potentially less of an issue if your diet includes meat and fish, and research has shown that phytic acid in the diet also has some protective health benefits.